Key Difference: The terms Roti and Chapati are often regularly used when it comes to Indian cooking. In general terms, a roti is a type of Indian flatbread. There are many different types of rotis, one of which is the chapati, which is a type of roti that is made from whole wheat flour and cooked on the tava, a type of flat skillet. The terms Roti and Chapati are often regularly used when it comes to Indian cooking. In fact, they are pretty much a staple of Indian cooking and are often present at most, if not all Indian meals. However, different terms, such as roti, chapatti, phulka, etc. may be used. The usage of such varied terms leaves not only non-Indians, but Indians confused as well. The confusion behind the terms comes from the fact that there are so many different cultures and languages at play in India. Everybody has a different name for the same or similar thing. In general terms, a roti is a type of Indian flatbread that is made from whole wheat flour, which is locally known as atta. However, some people do tend to use all-purpose flour (maida) or a mixture of atta and maida. In most households, atta is used. A dough mixture is created from atta and water. Some people tend to add salt for taste, others don’t. Sometimes oil or milk is added to the mixture to change the texture and make the roti softer and chewier. The dough is then divided into small palm shaped balls. These balls or portions are then rolled out either by hand or via a rolling pin into a thin flat circular shape. This is then cooked either on a tava, which is a type of flat skillet, directly on the flame, or in a tandoor, which is an open air coal oven. Each person has their own version of roti that they make at home. This version is based on personal preference, or more likely on the recipe that is passed down the generations in their family from mother to daughter. Hence, over time many different version have developed, and various different terms as well. 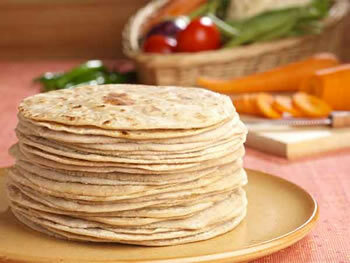 Most commonly, rotis are made from whole wheat flour and cooked on a tawa. This version of the roti is commonly called a chapati or chapatti. Hence, it can basically be said that a chapati is a specific type of roti. The chapati is the version of the roti that is eaten in most households. It is easily the most common type of roti consumed by the public. 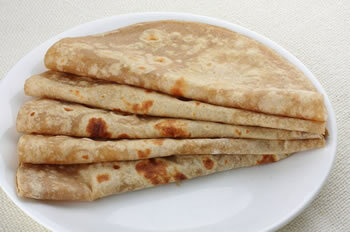 Yet many people still refer to this as roti, while others refer to it as chapati. It is mostly eaten with various types of dals, lentils, vegetables, etc. Varied depending on the type of roti. Can be made from whole wheat flour, all-purpose flour, corn flour, etc. Most useless blog i have ever read.Such a stupidity,repeating the same thing in ever paragraph. @Anku,I am not the owner of this blog but a visitor happen to see you comment and I cannot keep silent about it. To you, maybe is a form of stupidity because you grow up on roti and chapatti almost everyday, and maybe you have good family members to explain to you the similarities and differences between them. To the rest who stay outside India, this is a piece of very useful and valuable information, especially for school children who are on a project learning about the food people in India eat everyday and their similarities and differences. Just like those people who live and grow up near Taj Mahal, they would find nothing new about the building because they look at one of the 8 wonders of the world EVERYDAY. However for foreign visitors, this is something they have seen for the first time in their lives and they are excited about it. Complaining about the work of others is pointless and no one will respect you after seeing your comment. Instead, you should set up a separate blog, write about the same topic in another way you find is more outstanding than this and invite people to view your work. However while you extend you invitation and at the same time bad mouth another person's work, then no one will be interested to view you blog because no do not deserve the respect from others. Remember, DO NOT BE TOO EGOISTIC, LEARN TO BE HUMBLE. Sadhu, Sadhu.